When Samsung took the stage at the 2015 Flash Memory Summit, they admittedly didn't deliver any bombshell announcements on the scale of the Intel/Micron 3D XPoint surprise, but they still had a lot to talk about. We knew that Samsung's third generation of V-NAND/3D NAND was on the way with mass production scheduled for the second half of this year. Samsung has now disclosed that mass production is starting this month, and that it's a 48-layer design with a 256Gb TLC being the first die announced. Samsung's current second-generation 3D NAND is a 32-layer design available as 128Gb TLC or 128Gb MLC. With mass production imminent, Samsung has ensured that neither SK Hynix nor the Toshiba/SanDisk joint venture will be able to leapfrog them with their respective 48-layer 3D NAND designs, both scheduled for mass production starting in 2016. 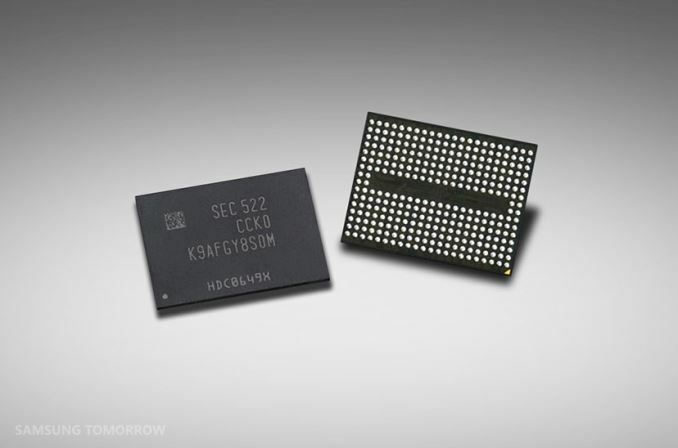 Samsung says the new 256Gb TLC will have about 30% lower power consumption than an equivalent capacity of their current 128Gb TLC, and a switch to a dual-plane organization ensures that one 256Gb die will perform at least as well as a pair of the current 128Gb dies. Density is improved by about 40% while production costs only increased slightly, so price per GB will be going down. At FMS, Samsung is pushing the idea that their 3D NAND TLC is ready to replace MLC for most uses, and they're optimistic about scaling up their 3D NAND layer count past 100. Samsung also shared information about three upcoming drives, all using TLC though not necessarily the new 48-layer parts. The PM1633 Enterprise SAS drive was previewed at CES in January and is intended for read-heavy workloads. A follow-on PM1633a model was mentioned to use the new 48-layer TLC to reach 15.36TB capacity, but we don't have any other information about that update. The PM953 is a enterprise NVMe drive in M.2 or 2.5" form factors, and is the counterpart to the MLC-based SM951. Of particular interest, the M.2 version is using the M.2 22110 form factor (22mm x 110mm, the maximum length for M.2), with Samsung using the extra space to implement power loss protection. Meanwhile the PM1725 is a fast multi-TB PCIe expansion card that Samsung intends to use to challenge the assumptions about what uses TLC is suited for. Relatively speaking it appears to be intended for workloads that aren't very write-heavy, but it still manages 120k IOPS for writes. That just looks small compared to 1M IOPS for reads and a sequential read speed of 5.5GB/s. All three drives are intended for OEMs, but the PM953 will probably find its way into the retail channel just like the SM951. Finally, along with Samsung's new 3D NAND appearing in the afformentioned new drives, it will also be appearing in at least one of their existing drives. The 850 EVO, Samsung's current consumer TLC drive, will apparently be getting an update to use the new 48-layer TLC, though it's not clear if this will be new capacities and/or a wholesale NAND update. Thanks Billy, it's nice to see so many great announcements related to SSDs recently. Adding a 256GB SM951 once my Sky lake build is complete (6700K wru). I can't imagine using HDD for system OS drives all these years, heck I'm trying to move away from them even for current data (probably get another 1TB EVO soon)... They've completely spoiled me. Oh no, don't get me wrong, for some people it's a very worthwhile purchase and there's absolutely nothing wrong with that. This is more of it not weighing heavily enough in benefit on my personal cost-versus-performance scale. While I've used enough SSD-equipped systems to note that they're quicker to boot up, shut down, and opening programs, the difference in tangible terms is a matter of a few seconds here and there when the SSD is paired up with hardware that can take advantage of the more responsive disk subsystem. That difference just doesn't mean anything to me since the majority of my time on a home computer is spent in a word processor. Once it's open and I'm happily typing away, there's absolutely nothing that SSD technology offers in terms of performance that I'd notice which is why I contend to people who ask me for an opinion that SSDs are among the most overrated upgrades that are commonly encouraged by the tech community today. They're right up there with vastly overspec'ed power supplies and pushing meaninglessly high resolutions that solely drive up the cost of a computer to increase margins on sales in an era of otherwise declining, commodity computing prices.